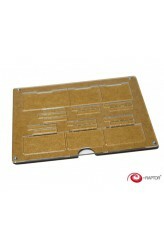 e-Raptor Insert compatible with Gloomhaven is a perfect accessory designed to organize and improve gameplay of the board game. Thanks to this insert you can arrange all game components and keep them in order – no more mess on the table while playing. No more looking for necessary elements during the game. 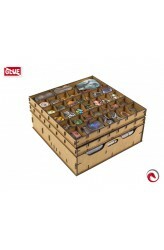 You can hold all your player boards, miniatures, tokens, sleeved cards, dials, boxes, map tiles etc. in one place without being afraid of losing control of the setting. They can be easily accessed and do not take as much space as during the game without an insert. Also, when the box is closed, the components are still kept in order, ready for setting another game quicker than ever before. The insert is composed of three large and accessible ..
e-Raptor Insert compatible with Great Western Trail is a perfect accessory designed to organize and improve gameplay of the board game. Thanks to this insert you can arrange all game components and keep them in order – no more mess on the table while playing. No more looking for necessary elements during the game. You can hold all your player boards, tiles, cards, cattlemen, engines, discs, etc. in one place without being afraid of losing control of the setting. They can be easily accessed and do not take as much space as during the game without an insert. Also, when the box is closed, the components are still kept in order, ready for setting another game quicker than ever before. 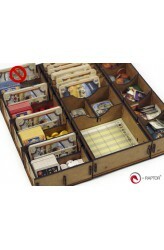 The insert is composed of 4 boxes (one for every player)..
e-Raptor Organizer compatible with Terraforming Mars e-Raptor Organizer compatible with Terraforming Mars™ is a perfect accessory designed to organize and improve gameplay of the board game. The organizer allows you to put cubes into special tracks to keep your production values in order. The tracks have special little insets to hold cubes (not too tightly, though – you can still move them). The rest of counters won’t slide off the player’s board as well. You can hold all your stuff in one place without being afraid of losing control of the setting and your resources. It's made of transparent plexiglass and first grade High Density Fibreboard. ..